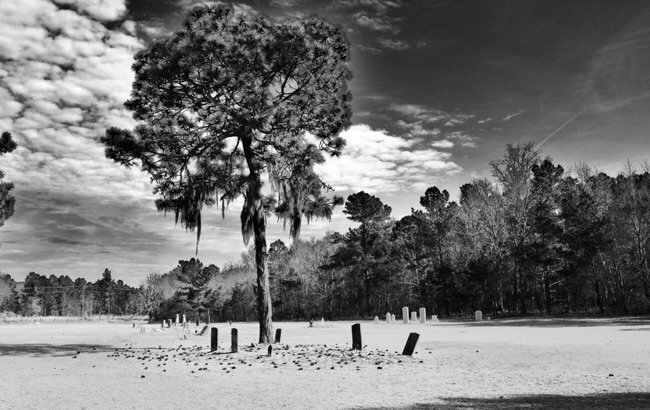 This isolated cemetery in rural Clarendon County stands alone on a cleared piece of land that suggests a church or other building may have sat nearby at one time. The cemetery, marked with a stone and called Rehoboth Cemetery, may have belonged to a church by the same name. Records exist of a Methodist church called New Rehoboth Methodist Church in East Jordan in Clarendon County. This church was built on an elevated lot as a chapel in 1831. Its purpose was to house parishioners for worship services during periods when the lower lands were susceptible to flooding. It is described as a “colonial frame with a spire” and was sold to an African-American congregation in 1932. Records also indicate that the New Rebohoth Methodist Church’s first clergy was “the same as Rehoboth,” suggesting that there was an earlier church with a similar name nearby. Whether or not this cemetery is connected to either church is unknown to the South Carolina Picture Project. Do you know a story or have any information about Rehoboth Cemtery? If so, please send it to the South Carolina Picture Project so we can solve this mystery. Thank you! Hello Judy, we attached you onto an email we sent out to the photographer, Chris Walsh, hope this helps! Is there any way I can get a copy of this picture? My mother’s parents and brothers are buried there. This would make an awesome Christmas gift.Thank you! On a 1921 map of Manning, it shows a school with the same name. I wish I could find info on it. Thank you so much for this valuable information! My great great grandfather, John Christopher Graham, is buried there with one of his sons, Milton Robert Graham, who died in the Civil War. The Graham Family History says that he raised his family on his farm near Rehoboth on the Santee River. There were often cemeteries near the larger farms. His only son to survive the war bought land near Jordan and Davis Station and had a church and a cemetery called Gethsemane. The church was moved down the road in 1879 but the cemetery is still there and is well maintained. Yes. Warren is on the board for the cemetery. There were 3 churches. Also Marty, Johnny James Jr, can also inform you of its history. I have a brother and three grandparents buried there under that big pine, and it's also where the rest of my family will rest once we leave this earth. Beautiful picture by the way! my family has lived about a mile from Rehoboth Cemertery, since the late 1800's and they say there has never been a church there. There's a man, Warren James, who has a place at Jordan who could probably fill in some of the information you want. His family has taken care of Rehobeth for years. Here is a good source on the scant information we have: http://digital.tcl.sc.edu/cdm/ref/collection/hrs/id/4303 Unfortunately, we do not know who cares for the property. Best of luck! Would like to know where you got your information and if there is information on the present day care taker.